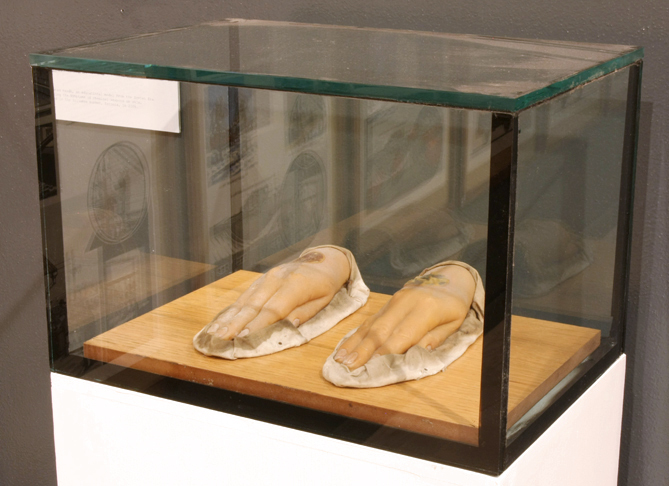 Another version of the work was shown in Kiasma – Museum of Contemporary Art, Helsinki in 2010. 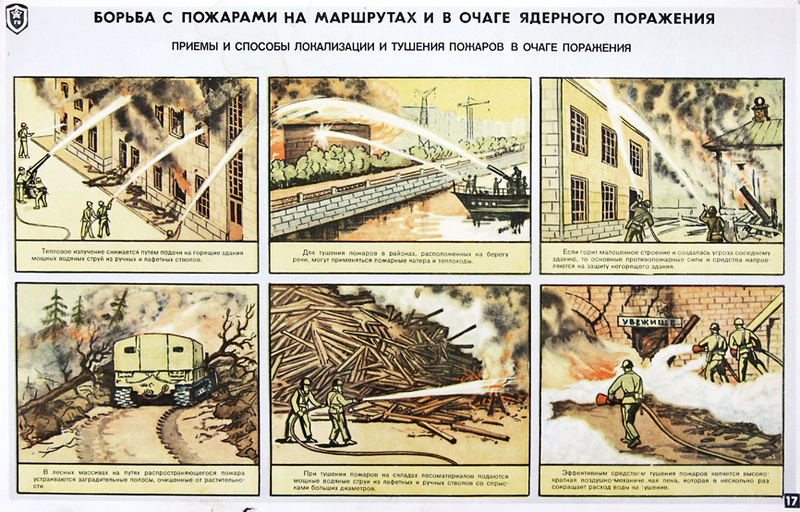 The collection consists of Soviet educational poster art on the theme of civil defence and firefighting designed to illustrate procedures in case of an attack with weapons of mass destruction. 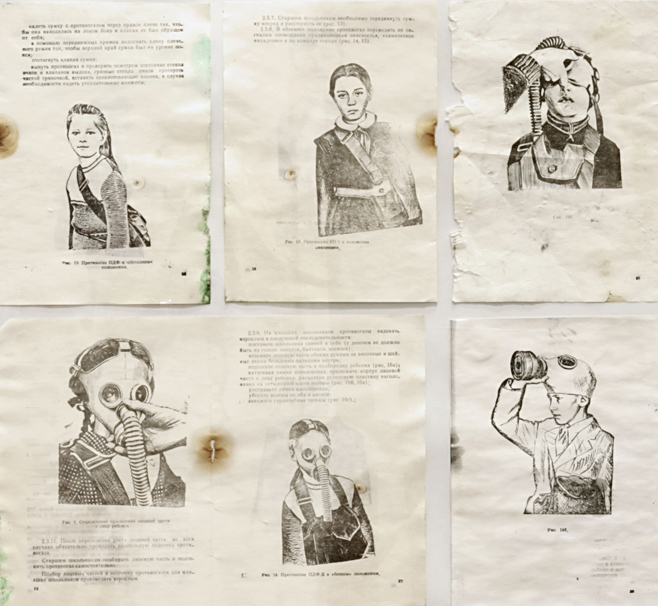 The material was discovered in an abandoned underground fallout shelter in Sillamäe, eastern Estonia. 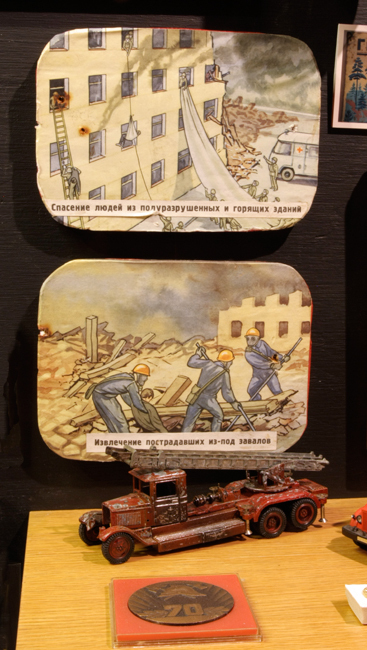 The bunker had in Soviet times housed a civil defence education exhibition for citizens, firefighters and civil defence crews. 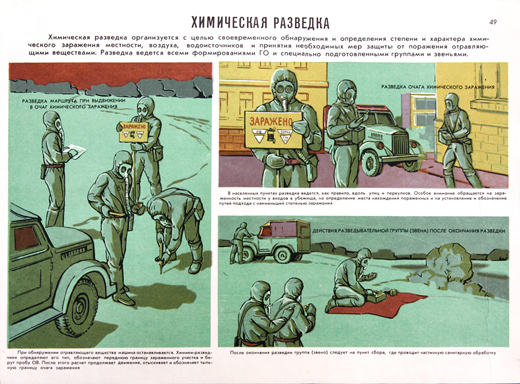 The education material dealt with different aspects of civil defence, such as first aid, fire suppression, preparing for chemical warfare and nuclear strikes. 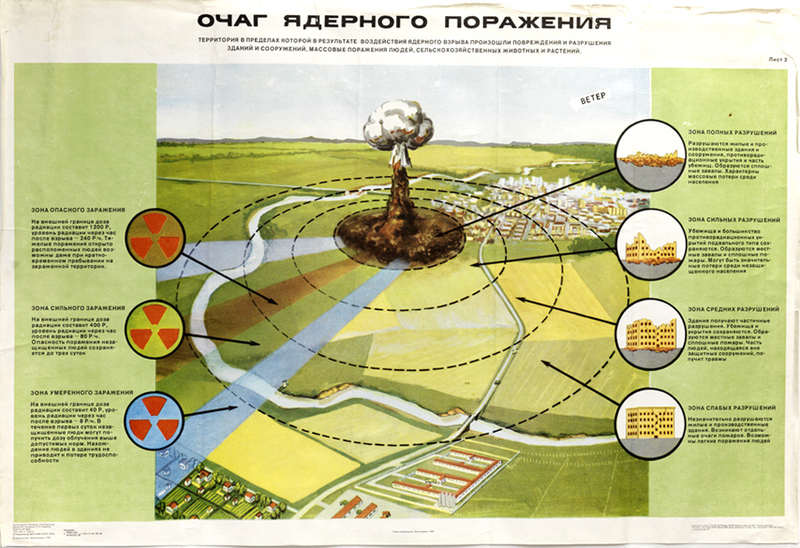 The main emphasis was on activities prior to and after a nuclear attack. 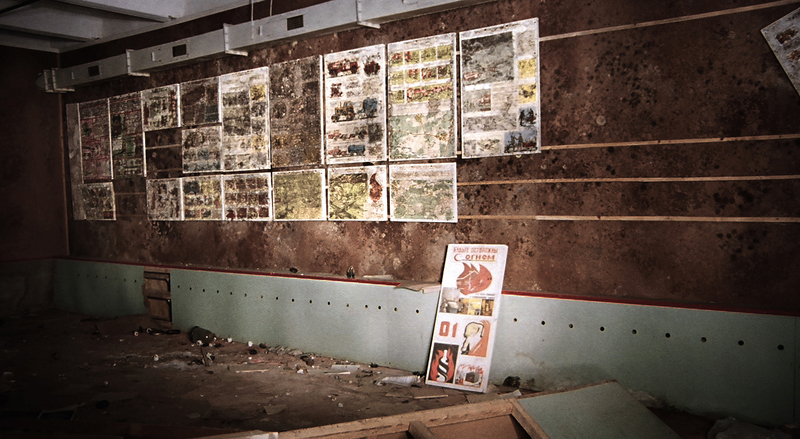 The town of Sillamäe was part of a Soviet military industrial complex. 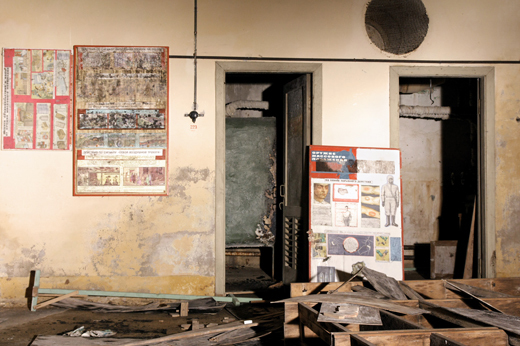 It was the location of a secret uranium enrichment plant and chemical factories. 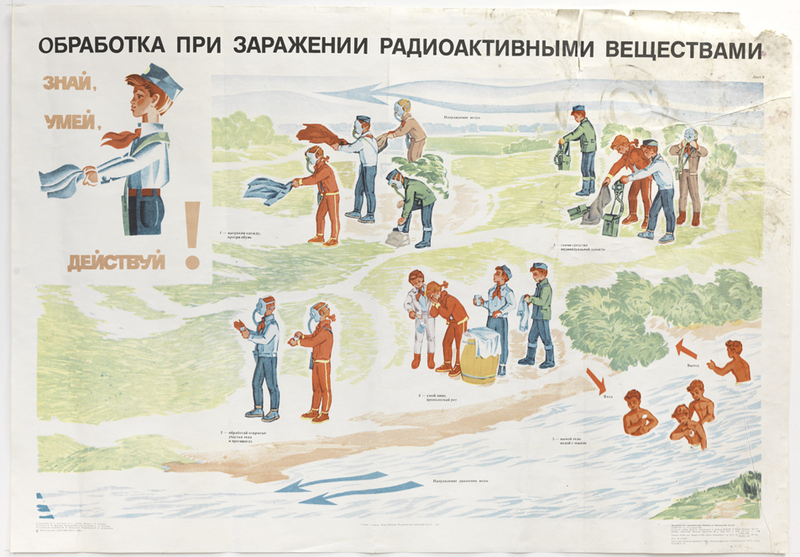 The workforce was imported from Russia, and Sillamäe was closed to outsiders up to the end of the Soviet Era. 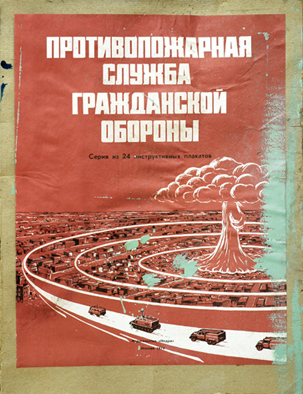 The bunker was abandoned when the Soviet Union collapsed. Although the material was upon discovery exposed to the forces of nature and vandalism, part of it was in 2008 rescued for future generations by the joint expedition of Romantic Geographic Society and The School of Esoteric Geography. The expedition members were J. Kivi, O. Kochta-Kalleinen and M. Leppänen. 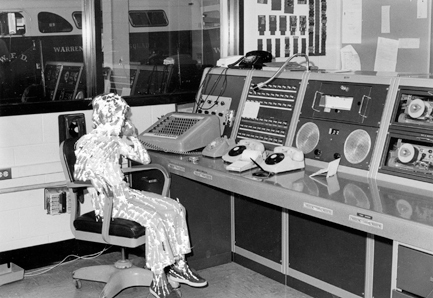 Originally the bunker was found by Finnish urban explorers Nila, Mortus and Wormwood about one year earlier. 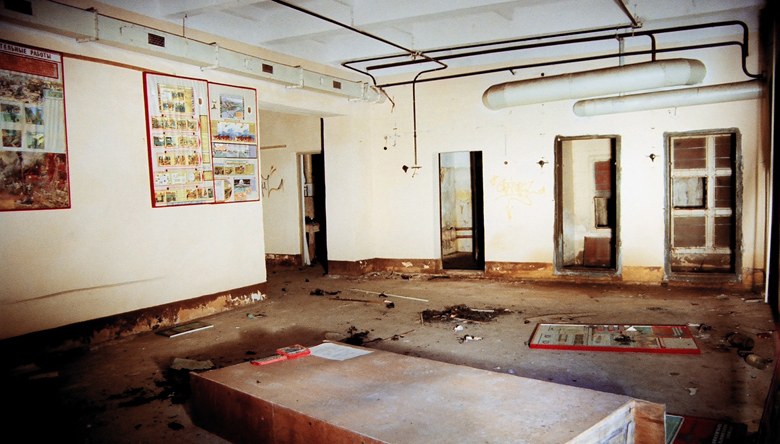 Later the entire bunker has been demolished. 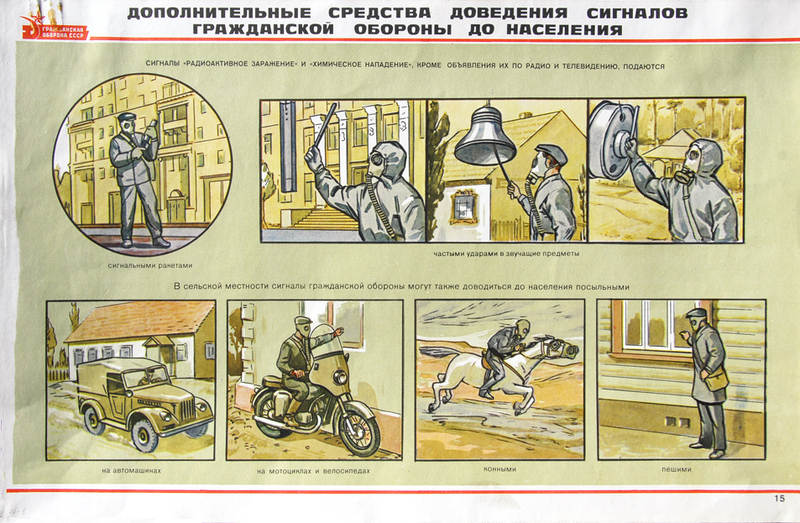 The result is a significant collection of Soviet poster art comprising about 130 works. 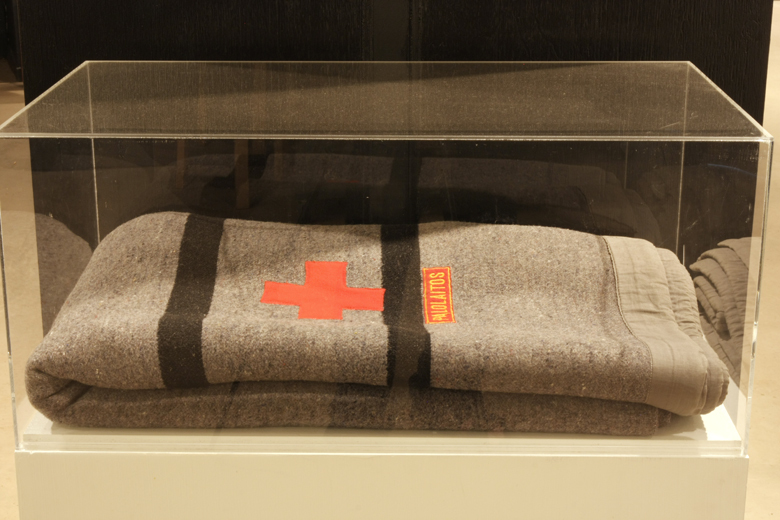 Thematically the collection remains extremely topical; preparing for a nuclear attack and nuclear fallout, as well as the hypothetical principles of any subsequent measures, are practically identical all over our planet. My childhood home was next to a fire station in Helsinki, and much of my childhood was spent in the station. 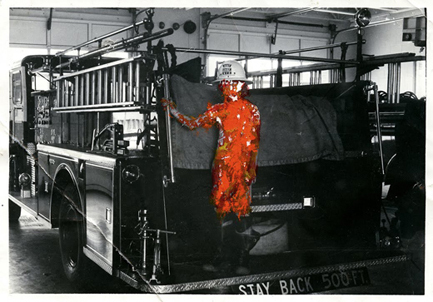 Firemen were my male role models and the fire station the geographical center of my imaginary world. 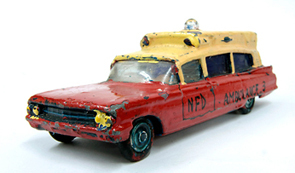 The starting point of the museum collection is concerning some items from that period: toys and childhood drawings such as the one I made at the age of five, a pencil rendering of a big warehouse fire in Helsinki in 1964, and also the self-portrait as fireman at the age of seven. 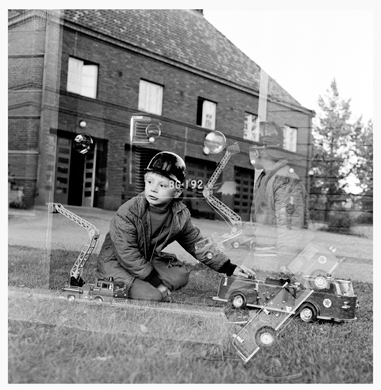 Another category worthy of mention are the staged photos taken by my father in the mid-1960s where I pose in the yard of the fire station with toy fire trucks and a helmet on my head, and also the snapshot of a few small fire engines in an operative situation on the floor. Some of the toy engines in the collection are the same as in the photos. 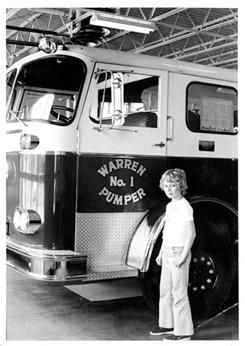 In June 1971, I went on a visit to Warren, Ohio. I was 11 at the time. My grandmother’s American-Finnish cousin Reino “Ray” Niemi lived there. 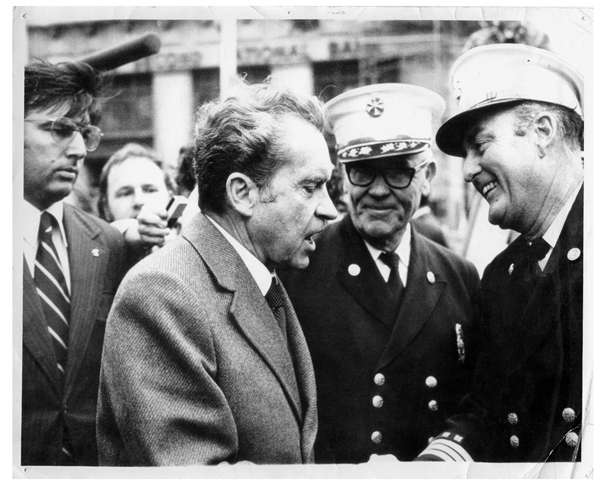 He was the Assistant Fire Chief. 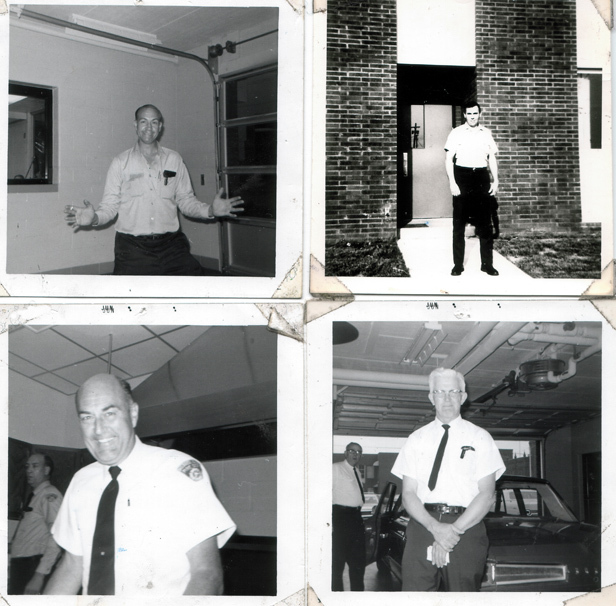 Every third day, Reino was on duty at the station on a 24-hour shift, and so was I. I slept in the firemen’s dormitory and when an alarm went off, my place was with Reino in the command car. 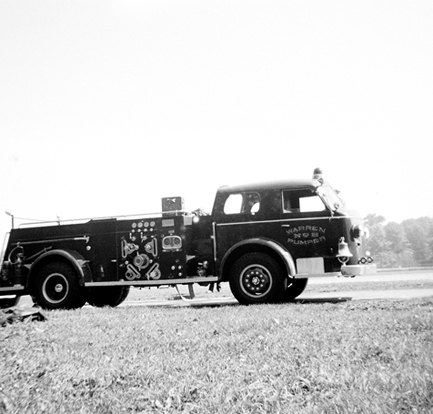 Although no dramatic fires occurred, that month at the fire station remains in my mind clearer than any other month in my life. 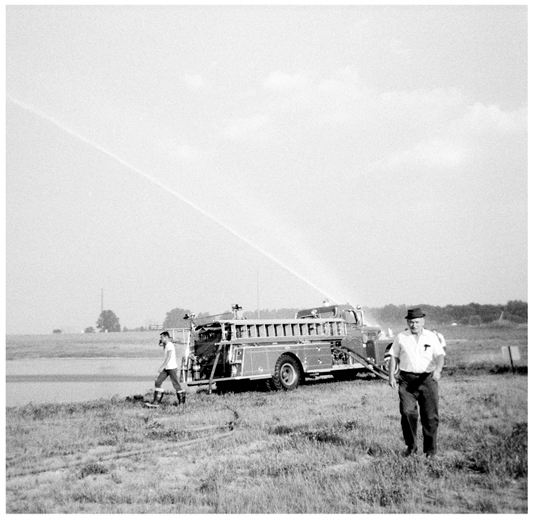 I was given a simple Kodak Instamatic camera, which I used to take photos of the firemen and fire engines. 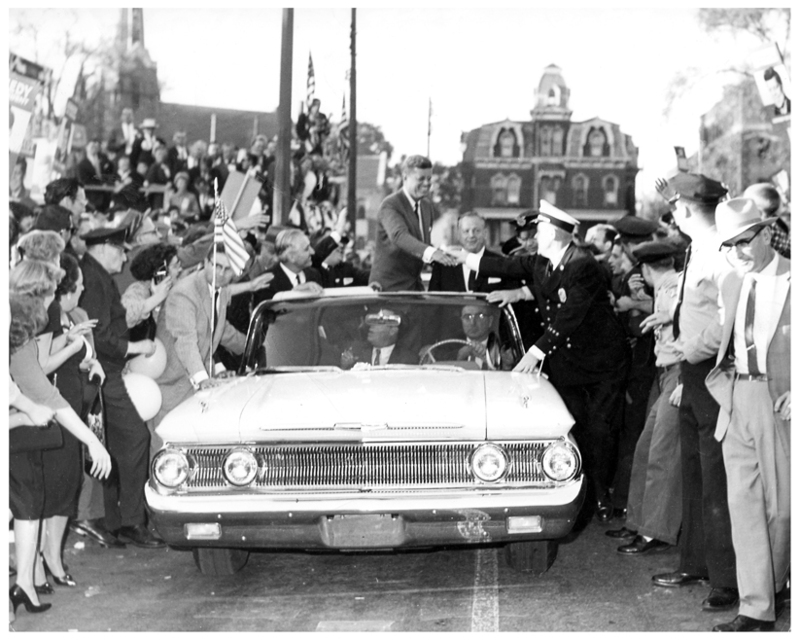 The collection includes also a few photos sent by Reino to his relatives in Finland, such as the one where he and Bruce LaBaugh, Chief of the Warren Fire Department, are greeting President Richard Nixon, and a picture from the 1960s in which Reino shakes hands with John F. Kennedy. 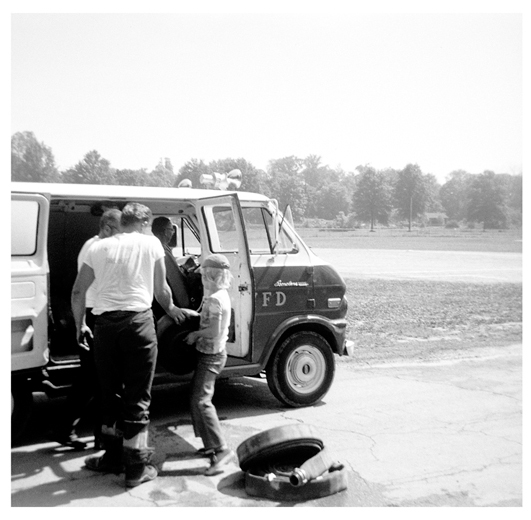 Most of the other black-and-white photos are taken either by Reino or the fireman serving as Fire Investigation Photographer. Some of the objects were received over the years as Christmas presents from Reino and his wife Esther. 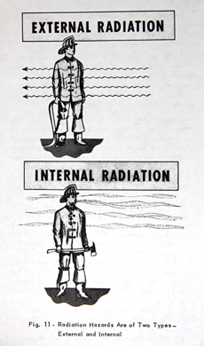 There is also Reino’s smoke mask from the 1950s, Fire Service Training textbook, and a black fire helmet I got already at the end of the 1960s. 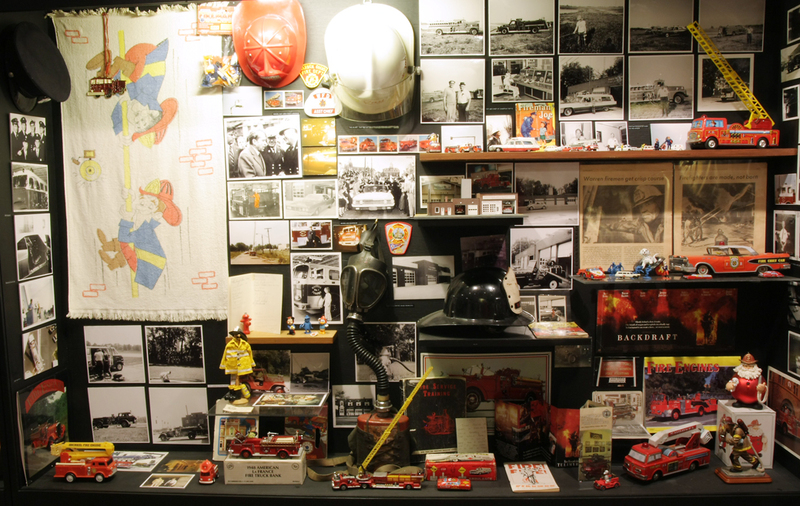 Other items include a white fire chief’s helmet, donated by Reino to the collection. 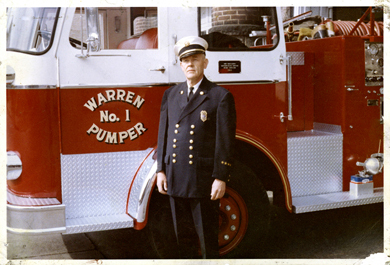 He received the helmet as a gift from the neighbouring fire department when he retired after forty years of service. 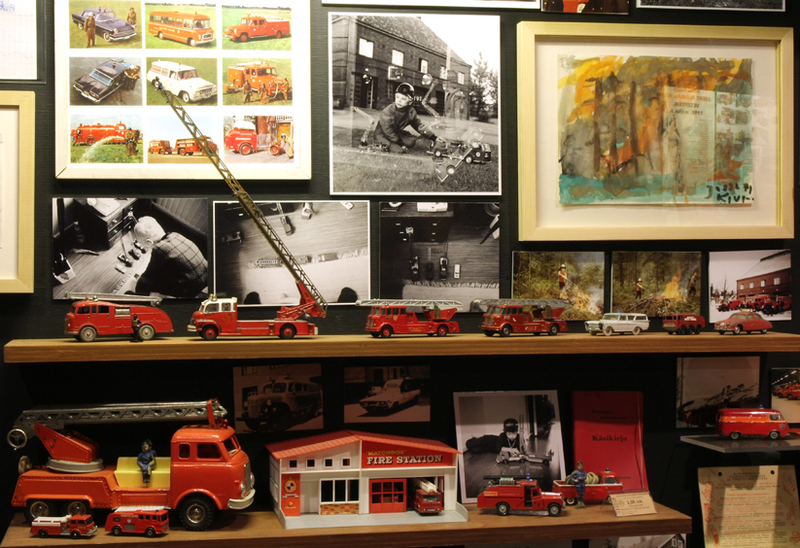 In the late 80’s I started collecting all kinds of objects related to firefighting and gathered them into a spare walk-in closet and called it “Fire museum”. Later the museum ended up in my studio where I kept it half hidden behind shelves and curtains. 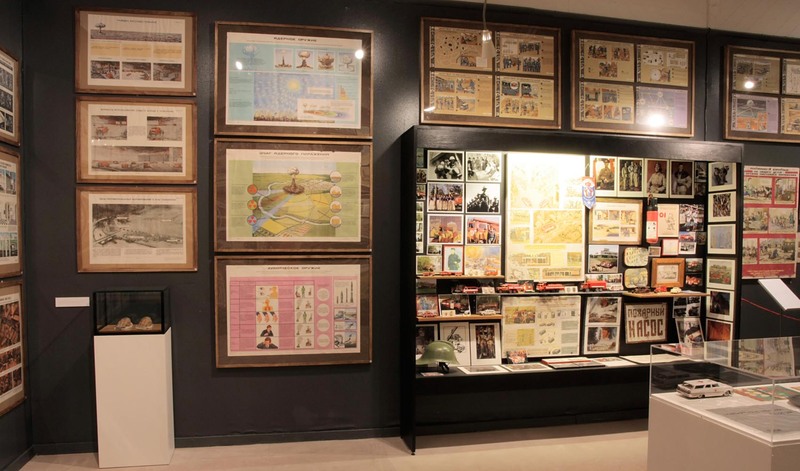 During mid 2000 the collection had grown too large and I began to doubt the idea of collecting. I closed “The museum” and packed down the items. Even though the museum presentation was composed like an narrative artwork and I showed it to friends, I did not consider it a work of art. 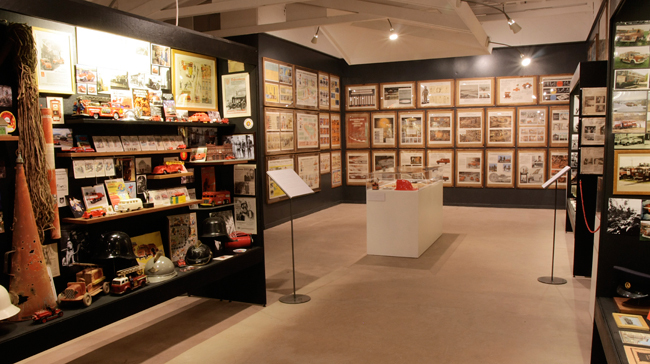 For me it was a just an therapeutic & escapist childhood passion, but when the Sillamäe bunker gallery was found things changed. 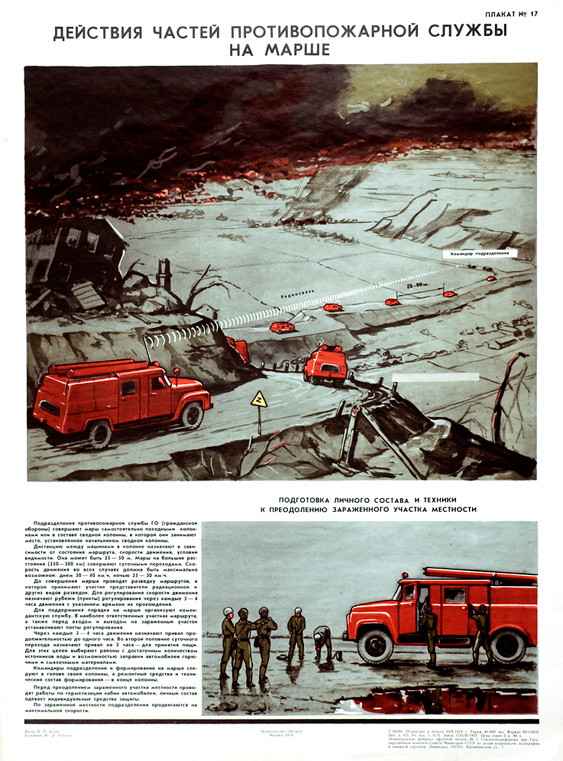 The merging of the apocalyptic soviet poster collection with the earlier firefighting material led to the inevitable transformation of the new compilation into a politically conscious work of art. 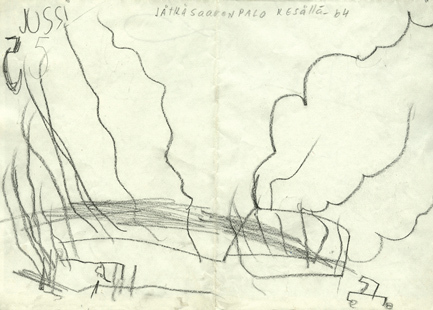 Burning warehouse’s in Jätkäsaari, Helsinki, summer 1964 Drawing made at age 5 on the basis of news footage seen on neighbor’s black and white TV. 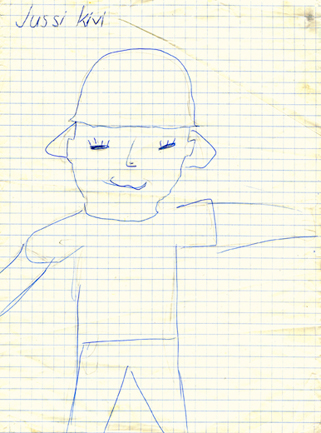 Self portrait as a fireman, age 7. 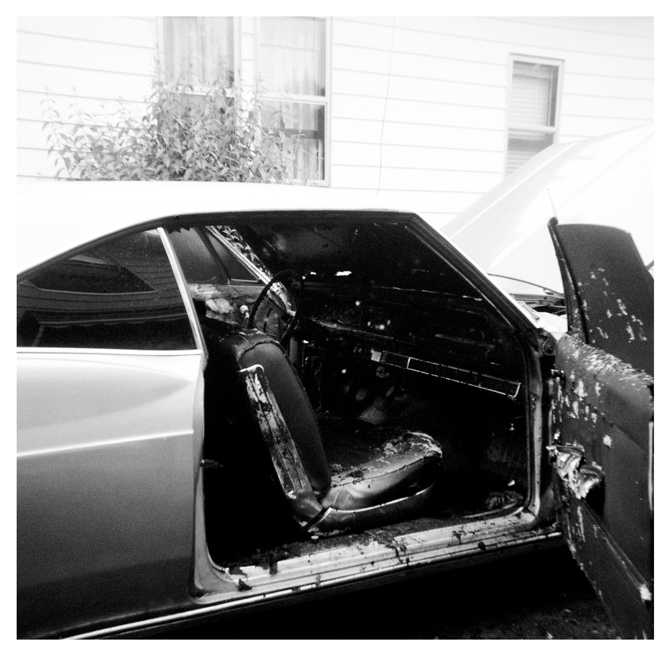 These photos were taken by a firefighter who worked as the photographer of the fire department. He and Ray ordered me to pose in different positions – which I didn’t like too much. I felt that I looked like a stupid babyface in those photos and as a smart teenager I later censored them by scratching or with orange paint. 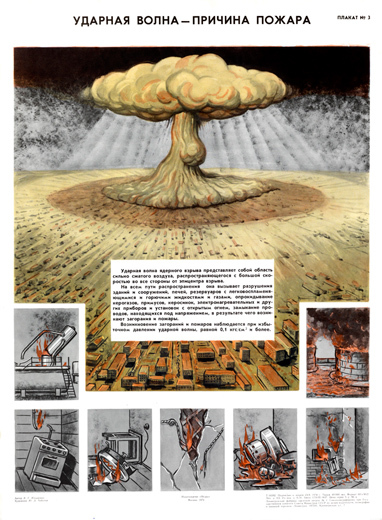 NUCLEAR STRIKE DISASTER ZONE The disaster zone is the area of damaged and destroyed buildings and structures caused by a nuclear explosion, in which large-scale destruction of people, livestock and vegetation has occurred. SHOCKWAVES AS A FIRE HAZARD The shock wave of a nuclear explosion is a powerfully compressed area of air that expands very quickly in every direction from the point of impact. 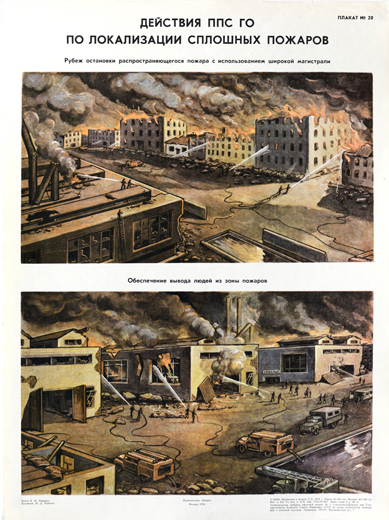 As it expands, it destroys buildings and other structures, breaks containers with flammable liquids and gases, knocks over gas, propane, and oil burners, electric heaters and open hearths, and causes short circuits in electric lines connected to a live current, which lead in turn to fires. Initial fires and fires ignite when shock wave overpressure exceeds 0.1 kPa/ m2. 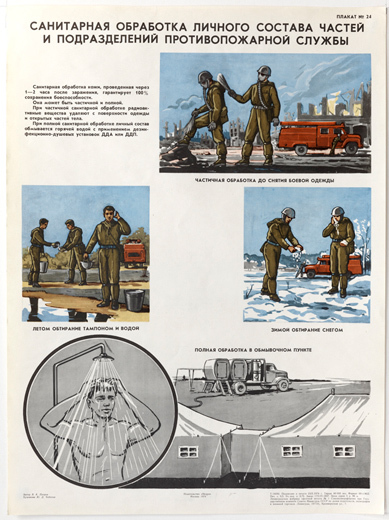 CIVIL DEFENCE EDUCATION FOR YOUNG PIONEERS: CLEANING PROTOCOL FOR REMOVING RADIOACTIVE PARTICLES LEARN, KNOW, ACT! 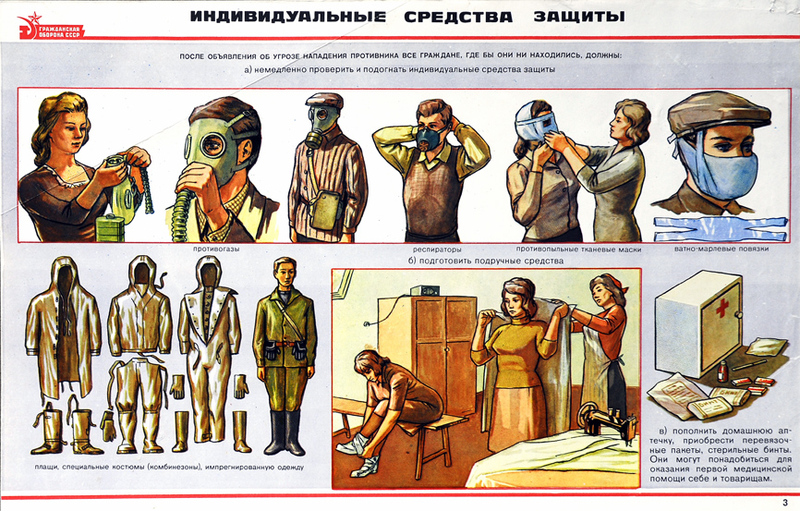 CHEMICAL WEAPONS The armies of capitalist states include in their arsenal several chemical weapons, primarily poisonous substances that can damage humans and animals and contaminate the air and the environment and everything in it.